Did you know facts about polar bears? Perhaps not! 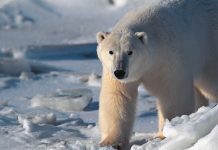 Let me take to the Arctic where you get to know some of the special facts about polar bears. Polar bears are probably the only bears that have long fascinated biologists not only for their super strength but for their ability to swim great distances. We have managed to gather some of the most amazing 21 facts about polar bears. 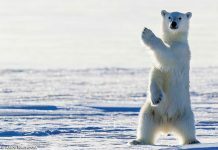 What are Interesting Facts about Polar Bears? Polar bears were separated from brown bears some 600,000 years ago. They are the largest living carnivorous animals on land. Polar bears are also referred to as marine mammals because they spend much of their lives in water. 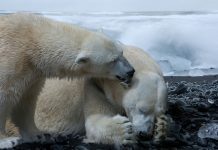 Scientists believe that they have observed a decrease in the polar bear’s skull size in the last 118 years. This is possibly due to the environmental pollution. A new born polar bear weighs as little as 500 grams whereas a fully grown adult weighs as much as 700 kilograms. The cubs gain weight up to 14 kg in just 3 – 4 months after the birth. The adult male is nearly twice the size of an adult female. While the male polar bear weighs 550 – 650 kg the female measures around 200 – 300 kg in weight. 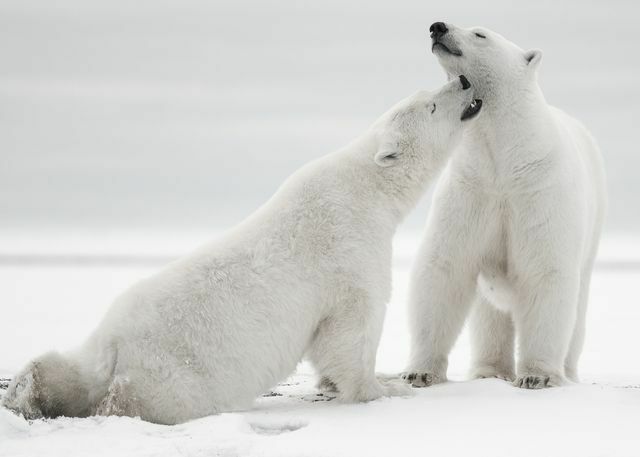 Male polar bears breed with the female which are less than half the size of their own. Males attain maximum size during their 10th birthday. Females are thought to breed only once in 2 – 3 years. During pregnancy she will enter into a dormancy (a sort of hibernation) state in a den. In November or December the female gives birth to twins or sometimes three cubs. During sleep the mother polar bear relies on her available fat. Sometimes the cubs in the same den are not real brothers or sisters. They are step brothers. Siblings can have different father. Polar bear cubs are not only blind at birth but they are also deaf. However in couple of months they will grow into the most powerful terrestrial animal. The weight of the bear is supported by the feet. The polar bear’s feet does not only spread the weight but they also facilitate the animal in walking over the thin sheet of ice. They serve as snowshoes. White bears possess tiny pads called papillae under their feet. The papillae prevent the animal from slipping while providing a firm grip on the ice. The white bear is one of the few terrestrial animals which can maintain a speed of about 3.5 miles per hour for many hours. Polar bears are strong swimmers and they can swim as much a distance as 4,500 miles in a single season. 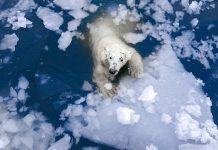 One polar bear swam as much as 687 kilometers (426 miles) continuously in 9 days. This is the maximum distance covered by any white bear in a single journey. 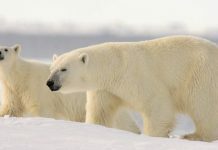 Polar bears possess one of the greatest home ranges of the animal kingdom. The average range is 350,000 square kilometers. They have black skin and black tongue. While white bears are able to see things in the low light of the arctic the bear’s sight is quite poor. They don’t rely on sight for hunting. Polar bears have nearly the same sight as that of humans. The estimated population of polar bears is 20,000 – 25,000 worldwide. One million ringed seals are needed each year to feed the entire polar bear population. Polar bears appear to be yellow in days when seals are abundant. This is probably due to the oil they eat from the seal—this makes the color of the coat slightly yellow. A female polar bear can go by 4 to 5 months without eating. Yet in starving she never refuses to nurse her cubs. That said, the female white bear is a highly devoted mother. A bear cub who is not a trained swimmer is likely to sit on the mother’s back while the mother swims. This prevents the cub from chilling into the icy water. Polar bears cannot suffer from snow blindness but if we were to spend that much time in the arctic we would surely go blind in just few days. Arctic bears have yellow pigment in the cornea which serves as eyeglasses and prevent the sunlight from damaging. About 60% of the polar bear’s population is found in Canada alone.